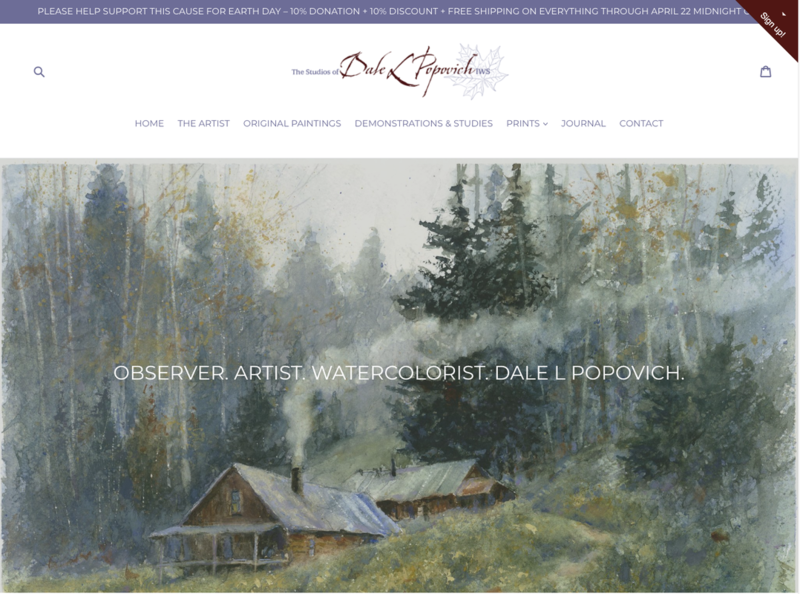 Dale L Popovich IWS is an award-winning watercolorist and teacher who is passionate about capturing the raw beauty of the American landscape with the fluid stroke of a brush. Talent and training aside, it’s Dale’s vision that best informs his work. By age 20 he lost 80% of his eyesight. Dale learned to rely on his mind’s eye to sustain him. After a nine-hour major brain surgery removing a cyst on his optic nerve, he had to learn how to walk and write again. With vision finally restored, he discovered he could see more clearly than before, efficiently filtering out the visual “noise” around him to focus on a subject’s essentials. His paintings began to reflect a certain purity of perception, and this “way of seeing” became the hallmark of his painting. Spending his childhood summers in the Northwoods of Wisconsin, Dale learned to love its colors, textures, denizens, and moods – developed his holistic approach to watercolor. Today, his paintings celebrate these American landscapes and man’s humble efforts to tame it. Trained at The American Academy of Art in Chicago by Director and President, Irving Shapiro, AWS, Dale was deeply inspired by this great American twentieth-century watercolorist. Dale later taught for 22 years at The American Academy of Art. Currently, Dale teaches at the prestigious Palette & Chisel Academy of Fine Arts in Chicago. The Palette & Chisel is an association of representational artists, founded in Chicago in 1895. It is the second oldest artist organization in the United States. He also teaches at Mainstreet Art Center in Lake Zurich, IL, and the Elmhurst Art Museum, Elmhurst, IL. Popovich has workshops, demos, and teaches weekly classes in his own studio in Highland. Also, Popovich and his wife launch an online art school, ToweringWindsAcademyOfFineArts.teachable.com. He wanted to share his knowledge with a broader audience. One of his passions is to Teach People to Truly See. Professionally teaching since 1978, Dale has trained over 2000 students – mentoring many who are now successful, accomplished artists. Dale, his wife, Marilee and their Pembroke Welsh Corgi live in Northwest Indiana. In addition, they own a log cabin in the Great Northwoods of Wisconsin. Dale is a signature member of the Illinois Watercolor Society. He is also a member of the Historic Brown County Art Galley Artists Association. His paintings and giclée prints can be seen and purchased at the Brown County Art Gallery in Nashville, IN and his online store. Devoted to both painting and teaching, Dale’s work hangs in collections around the country.